Shakshuka is banging at any time of day – I love it because it’s filling and full of protein. Crack your eggs in tomatoes flavoured with red pepper, onion and plenty of spices. Chuck in some spinach and serve with parsley, feta and pumpkin seeds, and scoop up with crunchy pitta. Preheat the oven to 200C/180C (fan) or 395°F/Gas 6. Boil a kettle then peel and finely slice the red onion. Deseed the red pepper (scrape the seeds and pith out with a teaspoon) and cut into thin strips. Heat a wide-based pan (preferably non-stick with a matching lid) with one tablespoon of olive oil over a medium heat. Once hot, add the sliced onion and peppers with a pinch of salt and cook for 5-6 minutes or until softened. Meanwhile, peel and finely chop (or grate) the garlic. Dissolve half a vegetable stock cube in 100ml of boiled water. Once softened, add the chopped garlic, smoked paprika, ground cumin and cayenne pepper. Cook for 1-2 min or until fragrant. Once fragrant, add the chopped tomatoes and vegetable stock. Increase the heat to high and bring to the boil. Once boiling, reduce the heat to medium and cook for 6-8 min or until thickened. Meanwhile, wash the spinach. Once the sauce has thickened, add the washed spinach and cook until wilted. Meanwhile, cut the wholemeal pittas into triangles and add them to a baking tray. Put the tray in the oven and cook for 8-10 min or until the pitta is crunchy and toasted. Meanwhile, crack the eggs over the tomatoey vegetables and cook, covered, for 4-5 min or until the eggs are cooked through – this is your shakshuka. Roughly chop the parsley, including the stalks. 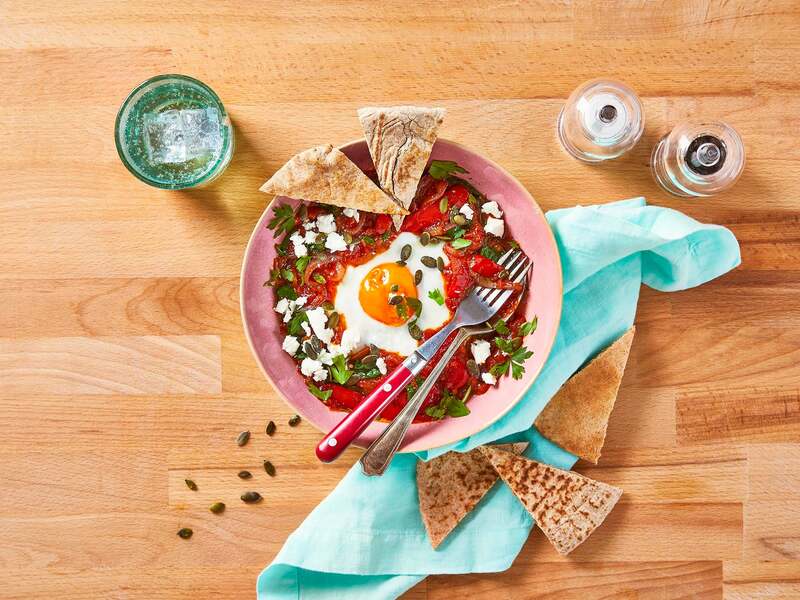 Serve the shakshuka with toasted pitta to the side. Garnish with the chopped parsley, pumpkin seeds and a grind of black pepper. Crumble over the Greek feta cheese and enjoy. Energy: 573kcal; fat: 19g, of which saturates are 7g; carbs: 67g, of which sugars are 12g; fibre: 15g; protein: 29g; salt: 4g.